From October 15th to the 18th, 2013, at the request of Mexican government veterinarians, the McKee Team traveled to Guadalajara, Jalisco, Mexico. The Guadalajara Metropolitan and adjacent municipalities make it the second most populous metropolitan area in Mexico, behind Mexico City. It is estimated that there is a minimum of one dog for every 10 residents. The Guadalajara Municipal Governments’ current method to curb street -or lost dog- population is to trap, house for five days, and euthanize, if the dog is not claimed. The euthanasia rate is 95%, McKee was invited to help change this and create a more humane and practical solution, by teaching it’s low impact high volume spay neuter technique and community-based strategy. The McKee Strategy has been a proven success in Costa Rica, where there are no government shelters. 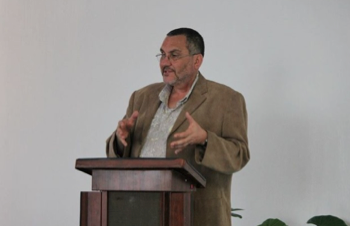 McKee approaches population control at the community level, where animals are born and live. 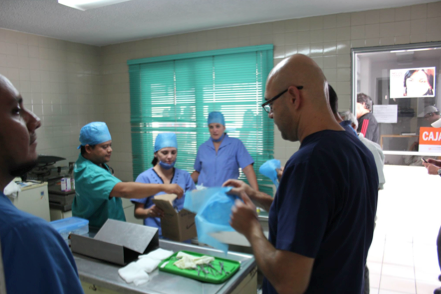 With support of the Minister of Health of Jalisco, Mexico, and from the Guadalajara Department of Animal Health, Mckee’s Advanced Spay Neuter Surgery Technique was taught to 60 veterinarians. The majority of veterinarians were from the government, with a small percentage from local animal welfare groups. The McKee Strategy not only is based on it’s high-volume low impact surgery technique, but in a strategy that does not utilize shelters nor euthanasia as well as provides a tool to humanely address serious public health issues such as rabies control. Thus also making the Strategy attractive to governments whose primary concerns are cost effectiveness and public health. Dr. Blas Rivas presenting McKee S/N Advanced Surgery Technique to the veterinarians at Guadalajara, Mexico. 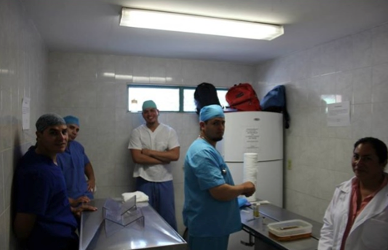 Department of Animal Health, Guadalajara, Mexico, surgery training facility. 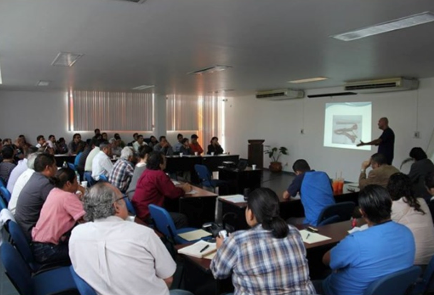 Dr Blas Rivas, McKee Chief Surgeon, with veterinarians in Guadalajara s/n training. -60 Government and non-government veterinarians were trained in the McKee Technique, a small incision which is less invasive, and can be provided in high volume, and cost effectively. 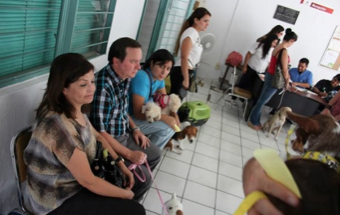 Prior to the McKee Surgery training course, Guadalajara veterinarians only spayed or neutered (s/n) dogs that were in the peak of health. They did not s/n young dogs, older dogs, nor dogs with any “perceived” issues. The McKee Surgery Technique is very low impact: a small incision utilizing a spay hook & recovery time is quicker. The McKee technique also allows for high volume surgeries: instead of a veterinarian providing 3 to 4 spays per day, a practiced veterinarian can provide as many as 20, safely. The McKee Technique also impacts cost of surgery, as much as 60% less expensive, depending on materials available and quantities purchased. -203 cats and dogs were spay/neuter as a part of the training. -The Mckee Surgery Technique DVD was distributed to ensure veterinarians have the step by step surgical material to review after the course. This training material was in part made possible by funds from the Marchig Animal Welfare Trust. 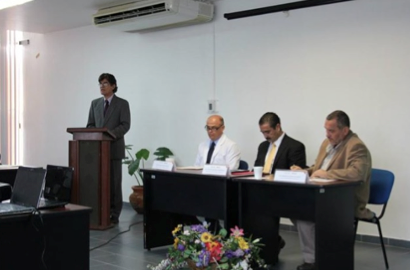 -The McKee Foundation was invited to 4 other Mexican States to provide McKee Strategy Training.